San Gabriel 15, La Salle 3 — Abby Siracusa swept in singles for the Lancers, but it was not enough to win the season opener. Kelly Chu won two in singles play for San Gabriel. Last week: Aram and I missed a lot of the same games, but overall I got him by one. He picked Mater Dei over Bishop Amat and Bassett over over Mountain View to pick up a couple, but I picked up some ground taking South Hills over Diamond Ranch, Colony over West Covina and can’t believe I picked up another game taking Santa Clarita Christian over Blair, who won 56-0. Yes, Aram took Blair. We’ll see what happens this week. Mater Dei edges Amat : The anticipation and heightened expectations for this Bishop Amat football season started very shortly after the Lancers’ two-point conversion attempt came up inches short in the final moments of the 2014 CIF-SS Pac-5 Division semifinal against Corona Centennial, preventing the Lancers from reaching the division final for the first time since 1995, the last time they won a championship. El Monte no match for Montebello: There was just no stopping Montebello High School football team all-purpose threat Isaac Mendibles on Friday night.The senior returned two kickoffs for touchdowns and had rushing and receiving scores to lead visiting Montebello to a 44-30 win over El Monte. West Covina falls to Colony: Defending CIF Southern Section Central Division champion Colony, ranked first in the division’s preseason poll, took advantage of five West Covina turnovers and an 85-yard drive late in the game to pull out a 28-21 come-from-behind win over the fifth-ranked Bulldogs in Friday’s season opener for both teams. Northview wins big: Northview High came out firing on all cylinders offensively in its football season opener Friday night. The Vikings needed every score to withstand a valiant comeback by Rosemead.In the end, Northview’s vaunted rushing attack was too much for the host Panthers as the Vikings came away with a 37-24 victory in the non-league game. Zion Echols leads Charter Oak: With the temperature in triple figures for most of the game, it would have been easy for Charter Oak to melt away in the Nevada heat.Zion Echols made sure that did not happenThe senior returned the opening kickoff for an 89-yard touchdown in his first of five visits to the end zone in the Chargers’ 42-21 road victory over Green Valley. Mater Dei 24, Bishop Amat 21 — It was there for the taking but four turnovers, including a biggie late spoils Amat’s hyped preseason. Another question is should they continue platooning quarterbacks? Bonita 49, Schurr 2 — Can’t find right words to explain how impressive this is. South Hills 7, Diamond Ranch 0 – Defense wins games when your offense scores once. Colony 28, West Covina 21 — Went back and forth with Colony finally pulling it out. 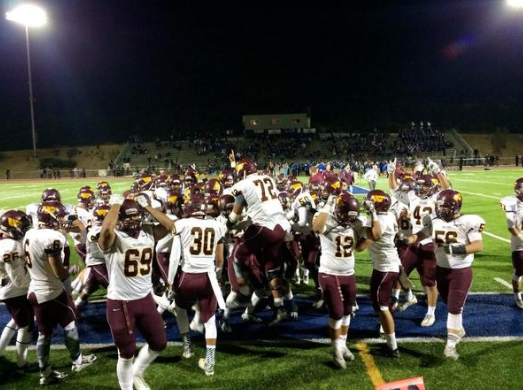 Don Lugo 34, Walnut 0 — How far has Walnut fallen? Montebello 44, El Monte 30 — Lions’ defense continues to make it tough to win. Gladstone comes up short in opener: If Jurupa Hills senior quarterback Julian Curiel was looking to make friends in the 2015 season opener on Thursday night, it didn’t take him long. Curiel completed passes to seven different receivers and 235 yards in the first half alone, and Jurupa Hills went on to beat Covina Gladstone 32-15 on Thursday night at Citrus College. 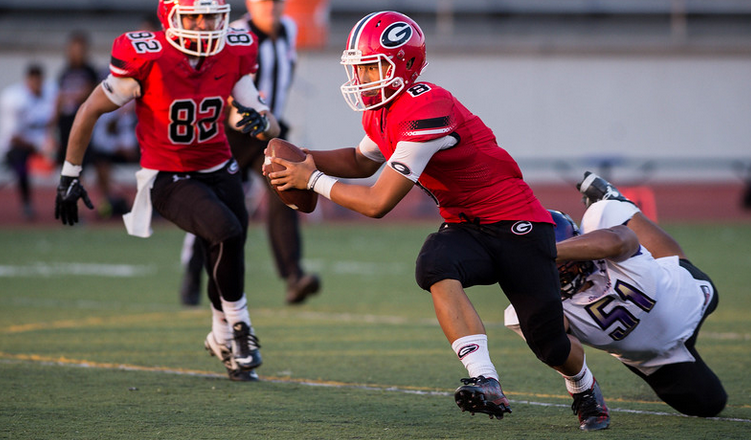 Curiel finished with 392 yards and three touchdowns passing in the game. While he spread the ball around early, it became clear who his top target is: Tre’veon Wellmaker, who caught 11 passes for 170 yards and two touchdowns, while running for another score. COACH FIRED: La Serna High School has fired football coach Margarito Beltran and placed the teacher on paid administrative leave following allegations of an incident involving a special needs student outside a classroom according to Rich Russell, the Assistant Superintendent of Personnel for the Whittier Union High School District. Beltran, a special needs teacher at La Serna, was preparing his team for Friday’s season opener against Eastlake High in Chula Vista. When the alleged incident took place is not clear. 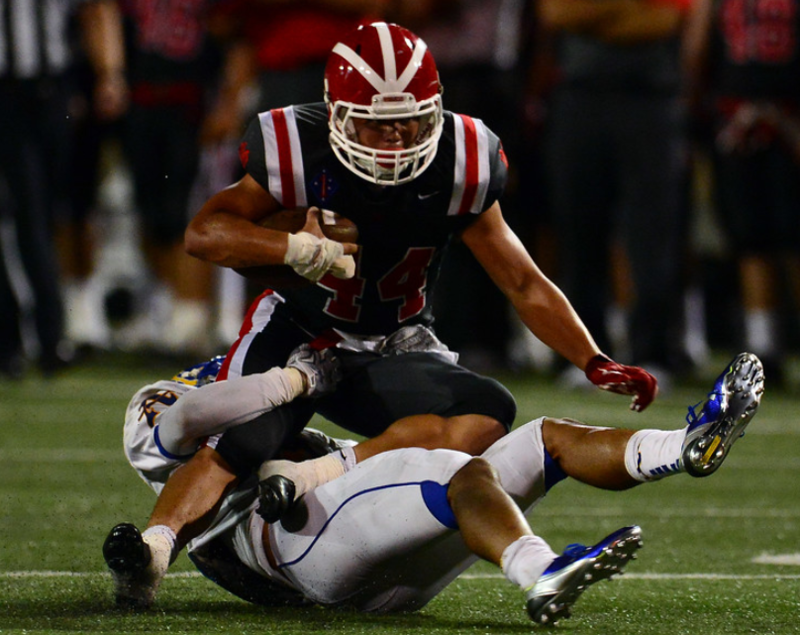 Mater Dei with SGV weapons: If the Bishop Amat High School football team comes up in its season opener against Mater Dei on Friday night, the reasons will likely hit close to home. In a strange twist, two of the San Gabriel Valley’s most talented players won’t be in uniform for Bishop Amat, but Mater Dei rather. And the question on a lot of people’s minds is, How did these two get away” Kickoff is 7:30 p.m. at the Santa Ana Bowl. When Mater Dei throws on Friday night, the Monarchs will likely target 6-foot-5 receiver Andre Collins, who doesn’t live anywhere near Orange Country. Nope, Collins lives in Hacienda Heights.